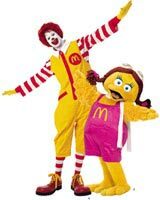 In a global television commercial just launched (10 June 2005), Ronald McDonald energetically rides a bike. He deftly shoots hoops with basketball megastar Yao Ming. He even snowboards like a pro. It's enough to make you choke on your super-sized happy meal. Yes, McDonald's "Chief Happiness Officer" now has a new title: "Amabassador of Balanced Lifestyles". But he won't be giving up his old job. The McDonald's-owned website, GoActive.com explains how Ronald juggles the two titles. "As McDonald's Chief Happiness Officer, Ronald McDonald is involved with anything and everything that makes people happy. He wants the best for everyone." And it seems that when it comes to what's best, fatty junk fare (described by GoActive as "tasty, wholesome food") is just not enough any more. In a stunning revelation, the site tells us that we now also need "physical activity that seems like play" and "robust good health". 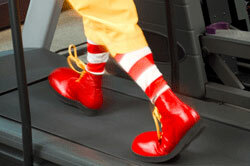 Enter Ronald in his new, ambassadorial role ... "Ronald believes in an active, balanced lifestyle. He lives one himeself. And he is the ambassador of active, blanced lifestyles for everyone." So just what does this new diplomatic status entail? GoActive explains that Ronald considers physical activity a "critical component of the energy balance equation". Wow, Ronald's starting to speak like an ambassador already! We ordinary folk would have said something low-brow like, "If you're going to eat fattening, junk food, you'd better try to burn it off with some exercise". Like any good diplomat, Ronald's pretty vague about how he's going to achieve this goal, promising to work "with the people of McDonald's in various ways to help parents and children identify realistic, fun ways to incorporate fitness and exercise into their daily lives." If Ronald's sounding ambassadorial, his boss, McDonald's Chief Executive Officer Jim Skinner, sounded positively Presidential when he announced his company's "It's what I eat and what I do ... I'm lovin' it" campaign. "We will use our size and strength to set an example," Skinner told the media. The campaign includes television adverts, new packaging, an updated Web site and a fresh series a videos featuring Ambassador Ronald teaching children how to eat well and stay active. And like a true diplomat, Ronald will soon get to demostrate just how multi-lingual he is. The new commercial airs first in the United States and will soon be broadcast in Canada, Germany, Italy, Portugal,China, Hong Kong, Singapore, Taiwan, New Zealand, Puerto Rico, Uruguay, Chile and Argentina. And that's only the beginning. The TV spots will be followed later this year with a series of "Go Active with Ronald McDonald" interactive community shows accross the US and in other countries. Active he may be, but it's obvious even Ronald McDonald will need some help in this historic mission. Tennis stars Venus and Serena Williams, hockey player Wayne Gretzky and speed skater Bonnie Blair are among the sporting luminaries McDonald's has pressed into service. CEO Skinner has declined to put a price tag on the mission, but perhaps the TV networks and sports stars will get with the public-spiritedness of the campaign and donate their services gratis. Of course, the company is adamant that none of this has anything to do with all those unfairly-critical articles in the media, alarmist books like Fast Food Nation, and muck-raking documetaries like Super Size Me. Nor, its insists, has it anything to do with recent court actions in which money-grabbing litigants have won millions of dollars in settlements. On the contrary, we're told, the latest campaign is just a natural evolution of previous efforts on Ronald's part to teach children how to keep safe, like fastening seat belts and wearing bicycle helmets - both very important things for kids to know, so we'll understand if Ronald forgot to warn them not to eat unhealthy food like burgers and fries. "This is just another way we're communicating with our customers on the importance of energy balance," company spokesperson Lisa Howard said. Hey, there's that "energy balance" term again. Sounds like Lisa's been getting some lessons in diplomat-speak from Uncle Ronald! McDonald's appears to have pulled the plug on Ronald's diplomatic mission. Try to surf to the GoActive.com website now and you'll be redirected to an error page on the main McDonald's website telling you the page doesn't exist. I guess every ambassador is recalled eventually, but I wonder what that says about the company's long-term commitment to the health of its younger customers?